Life is made up of many facets, and they are all equally important. A fulfilling life is one of balance. Even though, this blog is for supporting writers, I would like to encourage you to view your life beyond writing. Some of the areas I will suggest you look at are as follows. By looking at these areas, you will gain awareness of what might be missing in your life, or what might be needed in your life. Why is balance so important? Here is an example: Let’s say, like many people, you are focusing 75 – 80% of your energy on one area of your life, if something happens to change that one area, you won’t feel like you have much of a life left. Maybe you put most of your energy into your job or a relationship. If you were to lose your job or that relationship were to end, you would be knocked so off balance that it would most likely feel as if your life has ended. Using these examples alone, can you imagine how something like the above might impact your writing? Where is your life out of balance? Where do you focus the majority of your attention? What life areas are most satisfying? What areas are least satisfying? Have you been putting parts of your life on pause? If you are like most people, self-care is one of the most common things to be neglected. Things such as fun, time with loved ones, and your health are often put off until a tomorrow that seldom comes. 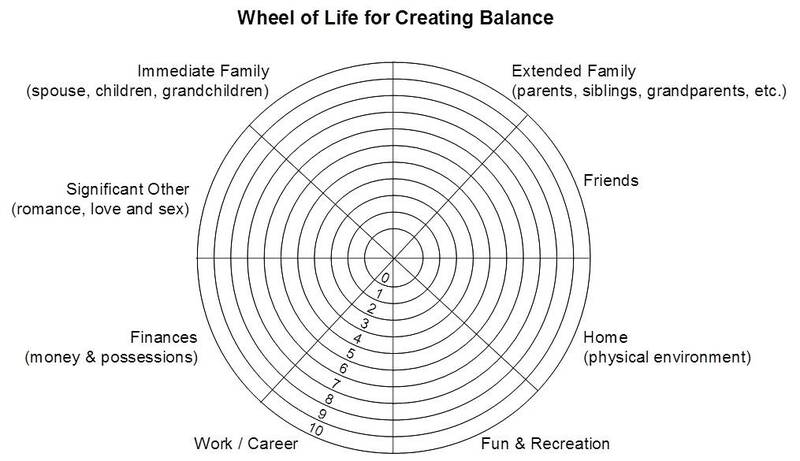 At the end of this post, you will find a “Wheel of Life for Creating Balance,” a “Health Wheel for Creating Balance,” and a “Writing Wheel for Creating Balance.” If you want to explore the facets of your life, duplicate these wheels and complete them as follows: Each section of the wheel represents an area in your life. 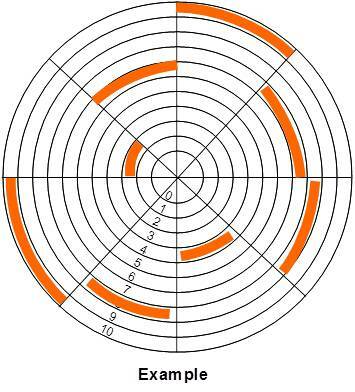 With the center of the wheel rated as zero and the outer edge rated as ten, rank your level of satisfaction with each area of your life by coloring in the appropriate space (see the example below). Zero should be used to indicate that you are not satisfied at all, and 10 means that you are 100% satisfied. Once you have colored your wheels, look at the outer edges. Are they smooth and even? Or are they uneven? Imagine these wheels are on the car you are driving through life. How easily would the wheels turn? How bumpy would your ride be? Now, imagine that you have a deadline for a personal or professional writing commitment, but you must be traveling in this car. You have paper and pen in the car, and someone is driving for you. How many words do you think you would be able to write down during this crazy, bouncy ride? How good do you think the story would be? Do you think you would be able to make your deadline? Keep your colored wheels for your visual representation when you come back for my next post. Also, in preparation for my next post, please buy or make a journal. Any notebook will do. However, there is something to be said about having a “special” journal for exploring your “Writer’s Whole Life Perspective.” I had promised we would be doing some goal setting next, but I am honoring my right to change my mind. Besides, I suspect most of you have already satisfied your goal setting needs with the new year coming in. There are a few more steps in the process before it will be goal-setting time. Next, we will be looking deeper at the colored in wheels. 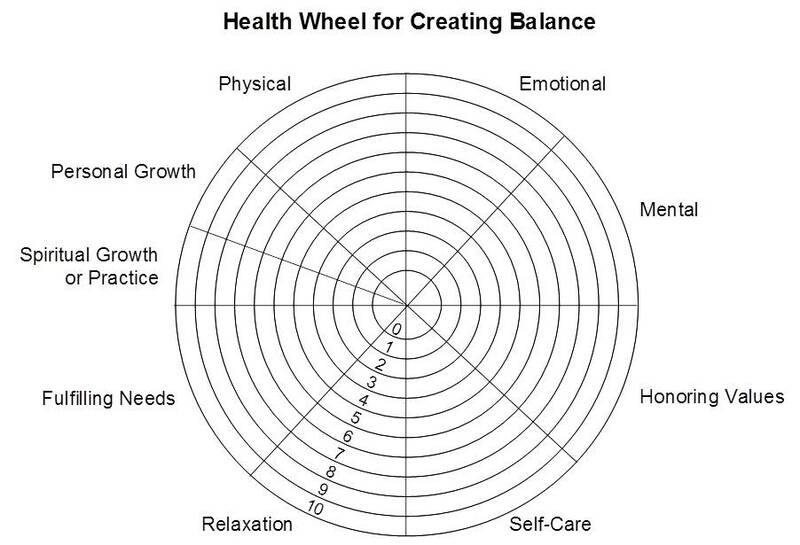 I created a “Health” wheel separate from the “Wheel of Life” because I feel our wellbeing is the foundation for a balanced life. I also believe it is the part that often gets neglected the most. 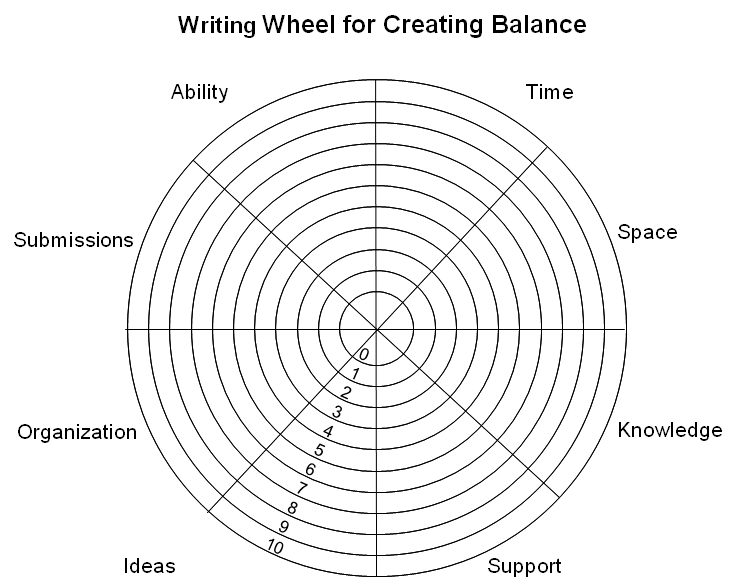 Your writing needs “for balance” might be different than the categories on my writing wheel. Feel free to create your own wheel based on what you believe is essential to your writing life. Alanye…this is fantastic! Thank you…I know this will be helpful for many of us. Balance in one’s life is the key and you have provided a wonderful way to look at the different elements in our lives to determine how balanced we are. :) I’m visiting my kids in Chicago and NH until Saturday afternoon…so unable to participate online as usual! Thanks, Vivian. I’m glad you are enthusiastic about life balance. Chicago is my home town. We were up there for Christmas. Enjoy your visits. I look forward to hearing how things went for you when you did the “Life Balance” exercise. Thanks for sharing this! It’s great information. I feel like I have good balance most of the time but I think doing this exercise could only help improve it. Thanks for dropping by my blog, Michelle. It is my pleasure to share with fellow writers. The exercise is great for creating awareness – more or less taking an inventory of your life. It is also a stepping stone or foundation to build from for the things I will be offering in future posts. I hope you will check back in. And, if you have any realizations, feel free to come back and comment after you’ve colored your wheels. Love the wheels. Helps look at our life as a whole. The toughest part is rating my life. 1-10 is always difficult for me. I’m glad you like the wheels. There are no right or wrong answers, Romelle. And nothing is written in stone. Just go with your gut. As I told Michelle, this is just a stepping stone (a kicking off point) for things I will be offering in future posts. You can always adjust your ratings as we move forward. I’m glad you like the wheels and post, Hannah. Thank you for the journal making tips. I am a big fan of journal writing, and I think your idea is great! Great wheels, Alayne. i was reflecting on the importance of balance when I chose my WORD for 2013, Centered. I hear ya, Joanna. They kind of go hand in hand, don’t they? (Centered and Balanced) Taking time to reflect is a great way to maintain or return to center, so it sounds like you already have a good practice going. I’m glad you like the wheels. This is so wonderful, Alayne. It’s going to be a fascinating exercise to color in those wheels. Thank you SO much for doing this with us. It is my pleasure, Beth. Thank you for letting me know you plan to do the exercise. What a perfect way to begin a new year, Alayne. I’m looking forward to your next post! Thanks, Jarm. I appreciate the support. It is encouraging to know someone is looking forward to my next post.